Fuel cell boat through the canals Written on November 30, 2009, by Ingeborg. If you’re not the kind of tourist in Amsterdam that wants to exhaust fumes into the air (in any way), your boating trip can be emission free as of today. 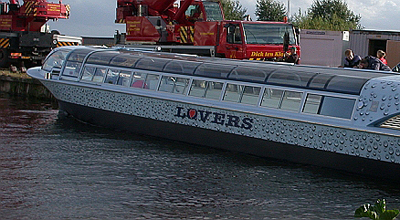 The new tourist boat by Lovers drives on electrics powered by a fuel cell. The energy that makes the electrolysis to get energy into the H2 is delivered by a wind park in the North Sea. Read more from the New energy category. Stay up to date via RSS , or Trackback from your site.